Chakra literally means wheel or ring. Chakra’s are spinning vortices of radiant energy located at vital centres along the spine, connecting nadis ( psychic tubes,passage ways) to various bodily sheaths (kosha’s) on the physical,subtle and causal levels. 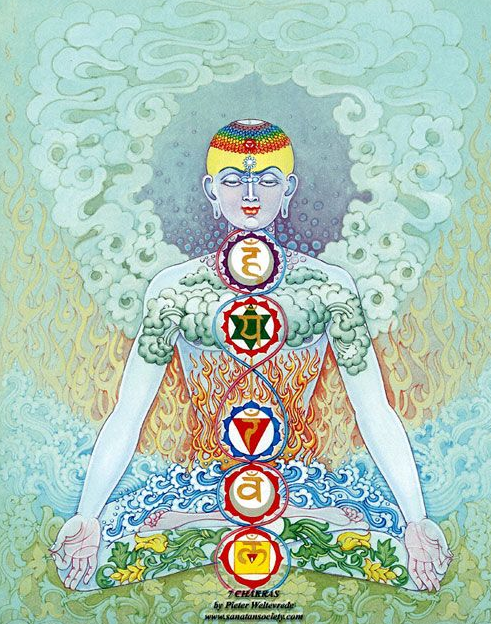 Chakras as receivers pick up vibrations and distribute them through out the body through the nadi’s ( psychic energy channels) - so they both take in and give out energy- accumulating it, transforming it and then transferring it. Therefore if a chakra is out of whack - too closed or too open we can feel this in our whole being and we feel and act off balance. Chakras are also meeting points for the two main channels- ida ( moon) and pingala (sun) which weave through the spine and cross at the chakras centre providing them with a direct source of balanced energy. Generally we want to keep all our systems in balance, though sometimes it is nice to take our awareness and energy to a specific chakra and corresponding body part as a way to feel more deeply and connect to what we need, through feeling and deep listening. There are many of these energy wheels residing within the body so generally we focus on the seven main ones that can be felt through experience. Sometimes we may need the courage for a big task such as public speaking- requiring confidence, clarity and humour - for this a beneficial yoga and meditation practice could focus on the sun in the body- third chakra manipura, and the communication centre of the fifth chakra Vishuddha. In most yoga classes there is a lot of talk about ‘opening’ the chakra’s- this opening helps us find connection on the physical, emotional and energetic levels and ultimately leads to the realisation of how interconnected and impactful our actions, thoughts and feelings are on our selves and how this travels outwards to our immediate and wider relationships and environment. Beyond this I think it is important to consider that the practice of yoga is to dissolve the chakras and our attachments to and through them. Chakra’s- as a beautiful, useful map tie us to the body, emotions and environment through their very nature- transcending them and our egocentric attachments is what provides freedom and the ability to live fully for others. For those who find it hard to connect to the notion of chakras residing within the body- your right on one level, they don't exist and function in the same why that your physical heart or pelvis exists- instead chakras offer us a way of reading the physical, energetic and spiritual body and provide us with a map of how to connect to ourselves on a deeper and more subtle level. One way to see if the chakra model works for you is to consider your life experience- have you experienced a break up that felt like it wounded your heart, zapped your energy, shortened your breath to gasps and caused you to close the door of trust to others ..? Have you experienced the bliss of a magnificent view thats taken your breath away, and lifted your fluttering heart and open arms skywards? These are signs of stimulation, surge or shift in the energy of Anahata, the heart chakra. Perhaps you can think of more examples to bring the chakras to life for you. I would encourage you to find your comfortable meditation seat and through a sitting practice see if you can make the chakra’s your own and use your imagination! Locate them from the base up, give them a visual, a colour, texture or whole landscape and a sense of how being resident in that space makes you feel. Keep steadily travelling with your breath from base to crown allowing this sense to grow stronger and become more embodied until you have a sense of the chakras resident within you. From here with an established practice the chakras can become a map for helping us to navigate the unpredictable journey of life from a place of full embodiment- letting go of what is non serving and providing us with more of what helps us serve others and ourselves to the fullest. Manipura: Seat of the Fire element. Yellow colour. Located around the navel. Power, energy, vitality, purpose, humour, anger. The Sun. Associated elemental Mantra: Ram. To Act.